While piercing guns may seem to be a quick and easy way of creating holes, they have major drawbacks in terms of sterility, tissue damage and inappropriate jewelry design. The piercing gun design was originally created over 100 years ago to reduce the pain involved with initial piercings by creating a hole as fast as possible. The piercing gun, in comparison is actually more painful than using the body piercing needle because the gun is smashing a piece of jewelry into your tissue which causes cartilage displacement. The piercing needle is creating a clean hole to then insert jewelry into. Over time we have become more aware of the body and its healing process, as well as what materials will work best for healing. Piercing guns do not have the appropriate material quality, or style of jewelry for initial piercings to heal properly. The quality and style of the ear rings used in ear piercing guns are not made with implant grade materials meant for wear in the human body, so most people with any sort of metal allergy will be allergic to the earrings used in these types of piercings. Piercings done with the piercing gun will take upwards of 1 year or longer to fully heal. Some people will never be able to fully heal an ear piercing done with the piercing gun due to the amount of damage done to the tissue from the blunt force of the gun, or due to the low quality of the jewelry material. Piercing guns cannot be sterilized properly. Anyone who has been pierced by a reusable piercing gun will become vulnerable to any blood borne pathogen left behind from the previous clients. This causes a huge issue for children who may have their fragile immune system compromised due to the spread of hepatitis and staph infections from these reused piercing guns. If we break down what the ear piercing gun is doing we can understand why the piercing isn’t healing as well as a piercing done with a sterile piercing needle. The piercing gun uses what is called a “starter” earring that is “sharp” on the end and forcefully pushed through the tissue. The problem with those starter earrings is that even though the one end is “sharper” than most traditional earrings, it still isn’t as sharp as a body piercing needle. This also makes it more difficult for healing because the sharp back end of the jewelry is not covered by anything and therefor left open to create wounds behind your ears if the jewelry puts any pressure onto the back of your ear or neck. The main reason for this article is to briefly inform you of the dangers of ear piercing guns and why you should seek a reputable professional to pierce you or your children. A professional piercer will be able to determine what type of jewelry is appropriate and perform a sterile and comfortable piercing, while also explaining in great detail how to care for your new piercing. 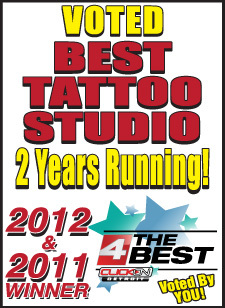 We have 2 experienced professional piercers, one at both of our locations in Rochester Hills, and Sterling Heights. Call either locations for any answers you many need about body piercings!